New England’s own Freeze has been dropping albums since back in 2007 when his debut “Red Snow” released and things only getting better. Since his debut he’s managed to unleash multiple solo releases alongside projects such as Beyond Top Secret and UFO(Unlimited Future Objectives), the latter of which also featured fellow rappers Madecipha and Xplizt. This UFO collaborative effort also landed the group a spot at the Gathering of the Juggalos as well. 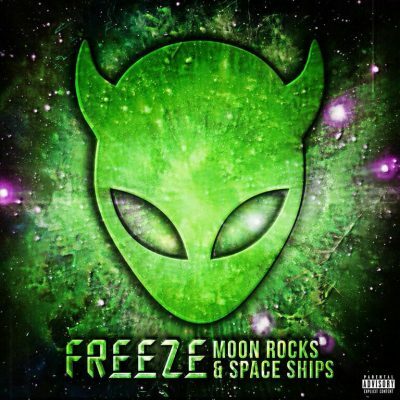 Of course, Freeze doesn’t stop there and once again elevates himself by bringing even more evolution to his style in the latest release, “Moon Rocks & Space Ships.” This album is the definitive version of Freeze‘s work or should I say the newly crowned Freeze Martian‘s work. Either way, this is a diverse album that truly showcases his versatility and range as an artist. This album will resonate with fans and newcomers alike. “Martian Landing,” kicks things off in proper fashion and delivers an amazing performance that could set the tone for any great album, but doesn’t prepare you for what’s to come. The track is hard hitting from the onset and Freeze‘s delivery is on a whole other level. Everything comes together perfectly on this track and shows a true dedication to the hip hop art form. It’s clear even from this opening track that Freeze has definitely stepped his game up even more. Tracks like “Out to Lunch” and “Underwater,” give us Freeze at his most furious pace. These tracks and others definitely manage to give us some more variety, but they also show off an amazing chopper like style throughout his verses. There are many more tracks that push his lyrical ability, but it’s these particular tracks that stand out because of their aggressiveness. While “Out That Hole,” certainly has a melodic chorus thanks to Alessa (of Heaven), Freeze is once again at a furious pace throughout his verses. This paring crafts a vicious and yet haunting track. It’s on tracks such as “Taking Us High,” that Freeze shows some great versatility with his vocals and delivers an amazingly sung hook. The track itself has a very mellow vibe and that transitions to his flow as well, which matches up perfectly and really seems to lift him up as an artist by giving a glimpse of how much he is capable of. “Home” is another example of this and with this track Freeze hands us what might be the best chorus on the entire album. “This Budz 4 You” and “Everywhere We Go” are straight bangers that I would say definitely have something special to offer for the smokers out there. The former features a guest verse from MNE’s own G-Mo Skee and as usual he slaughters his verse, thankfully Freeze knows how to bring it and tears apart the song while bringing it all together with a solid hook too. Overall this is an absolute standout album that everyone should take the time to check out and a record that will satisfy long time Freeze fans. Honestly, I’d be surprised if this doesn’t bring an even bigger audience into the Freeze Martian nation. The lyrical content, flow, beats and amazing versatility are all on point here. Usually I’d love to offer a few more great tracks that I haven’t covered, but realistically it’s hard to even pass over any on this release. Freeze should be proud that he has created a solid album through and through that truly shows off his evolution as an artist. This is in constant rotation for me and it should be for you as well, DO NOT pass this one up. If somehow you are on the fence, just check it out on Bandcamp or Spotify. Also, be on the lookout for Freeze to hit the road soon with his next show being with the legend himself, Esham. That show will be on March 17th at The Webster Underground in Hartford, CT. So, if you find yourself in the area I highly suggest you not miss out on this chance to see either of these two live. No matter what this is a must own for any underground or hip hop fan.